For the love of toast & all things grainy. I’m really starting to understand my clients when they say they just really love bread. For the first time, like, ever, I finished a loaf of bread without the need to put it in the freezer (which, let’s be honest, is rarely ever finished). It was the Baker’s Delight cape seed loaf which is oh-my-goodness-so-damn-good. A small loaf also costs more than a strong skinny latte, so letting it go to waste is almost criminal. So I made friends with bread and I love it dough much. But why are so many people going against the grain? One of the things that really grinds my oat groats is that our ‘health gurus’ get a wee bit confused when it comes to grains. (Maybe they are not eating enough to supply their brains with glucose to function optimally?) They often put the discretionary grain-containing foods in the same group as the high quality, wholegrain and fibre-containing choices, and then blame the Dietary Guidelines for our expanding waistlines and increased levels of chronic disease. So let’s have a refresher. The guidelines recommend eating a wide variety of nutritious foods from the five food groups every day, with the grain (cereal) foods being referred to as mostly wholegrain and/or high cereal fibre varieties, such as breads, cereals, rice, pasta, noodles, polenta, couscous, oats, quinoa and barley. That does not say pizza, cakes, pastries, biscuits and muffins. These products are made with refined grains e.g. white flour. Refined grains have had their bran and germ layers removed which in turns loses most of the fibre, vitamins, minerals and phytochemicals. Therefore, these foods are often low in nutrition and high in added fats, added sugars and/or added salt, and specified in the next guideline: Limit intake of foods containing saturated fat, added salt, added sugars and alcohol. These are the discretionary choices. The food to eat only sometimes. In moderation. Not e v e r y d a y. So the real issue here, again, is that we are not following the guidelines. In the 2014 Australian Grains & Legumes Consumption & Attitudinal Study, it was found that 70% of respondents were not meeting the grain recommendations. On the contrary, 81% reported eating discretionary grain containing-foods on either or both days in the survey. Your banana and blueberry bread does not count as a grain food. Or fruit either. Whether you use coconut oil or butter, rice malt syrup or sugar. It’s still energy dense. On a different note, get a loaf of this: there are many people, most notably young women (aged 19-30 years) in Australia, limiting their core grain consumption for other reasons..Like with many of my clients, 46% limit grains to assist with weight loss. Other reasons included preventing bloating, and concerns about preservation/additives and genetic modification. Plus they were often limited because of a lack of understanding of the health benefits of wholegrain consumption. Wholegrain breads and cereals provide us with so many of our key nutrients. They are abundant in dietary fibre and nutrients like folate, thiamine, Iron, magnesium, iodine. New research from Harvard University published in BMC Medicine earlier this year found that a diet high in whole grains and cereal fibre may reduce the risk of all-cause mortality and death from chronic diseases such as cancer, CVD, diabetes, respiratory disease and infections. Ask the students at the local primary schools I visit what fibre is good for. They’ll giggle and say ‘going to the toilet’. Fibre is great for our gut – it adds bulk to our stools & prevents constipation, and it helps the growth of gut microbiota. It also helps stabilise our blood sugar levels, cholesterol levels and keeps us fuller for longer. And what’s more, this research discussed that as dietary fibre intake is associated with lower levels of inflammatory markers and whole grain foods are abundant in fibre, these anti-inflammatory effects of fibre may explain why chronic disease mortality reduces with wholegrain consumption. Now, I’ve talked about oats and how to choose a healthy breakfast cereal. I’ve also mentioned quinoa and freekeh during my tales. So now I knead to take this opportunity to talk bread. I love the cape seed loaf because it’s 28% full of seeds and 100% delicious. It’s really chewy, which makes me eat and enjoy it slowly. This also increases digestion time so keeps me fuller for longer, and I’m actually finding I’m not looking for a snack mid afternoon as much. It is just so full of seeds and grains. 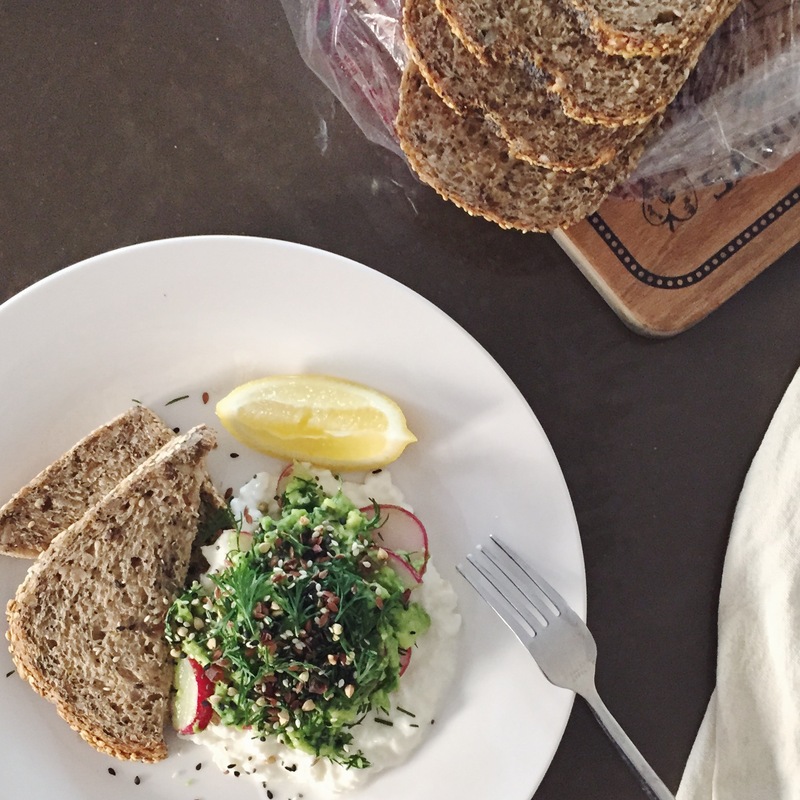 Sesame, linseed, sunflower & those poppy seeds that wedge between your teeth. Plus kibbled wheat, kibbled rye, rolled barley, rolled oats, wheat flakes, maize semolina, linseed, kibbled mung beans and kibbled soy. The addition of such goodness means that for every two slices of bread, you get approximately 7g dietary fibre (ladies that’s a quarter of your daily target, gents that’s 20%) and just over 12g protein (the equivalent of 2 eggs). Delicious and nutritious. 2. Give it a squeeze – if it stays squashed, put it back on the shelf. 3. Check the ingredients list – the less the better (except in the case of the above which clearly listed 9 grains & 4 seeds). Expect to see iodised salt & folic acid on non-organic breads made with wheat flour as this this fortification in mandatory in Australia. 4. Look for over 5g fibre per 100g on the nutrition information panel, but some do rise to the occasion with 7g or more. 5. Remember that salt helps bread to rise so low sodium breads are tricky to find, so look for a loaf that contains less than 400mg sodium per 100g. And then lastly, top it with these delicious toppings. What is your favourite bread & topping? P.S. Another reason why Melbourne is the world’s most liveable city – there is a cafe dedicated to toast. Check out Crompton coffee on Victoria St Richmond. It’s a toast lovers dream. Crompton ‘Nutella’ w/ candied hazelnuts and fresh mint + Coffee mascarpone w/ banana, caramel sauce and peanut brittle. Decadently delicious. < I finally watched That Sugar Film. Ohhh fig and ricotta…. Currently low FODMAPing to try to deal with lactose and fructose intolerance, so I would KILL for some ricotta and fig crumpets right now!!! I found dealing with people’s preconceptions of bread and labelling it automatically as a “bad food” one of the most frustrating things while working as a personal trainer, so good on you for giving it a better name!! You’ve made my day with that little gem – currently investigating!! Yay! You’re on fire, lady! Loving the puns! 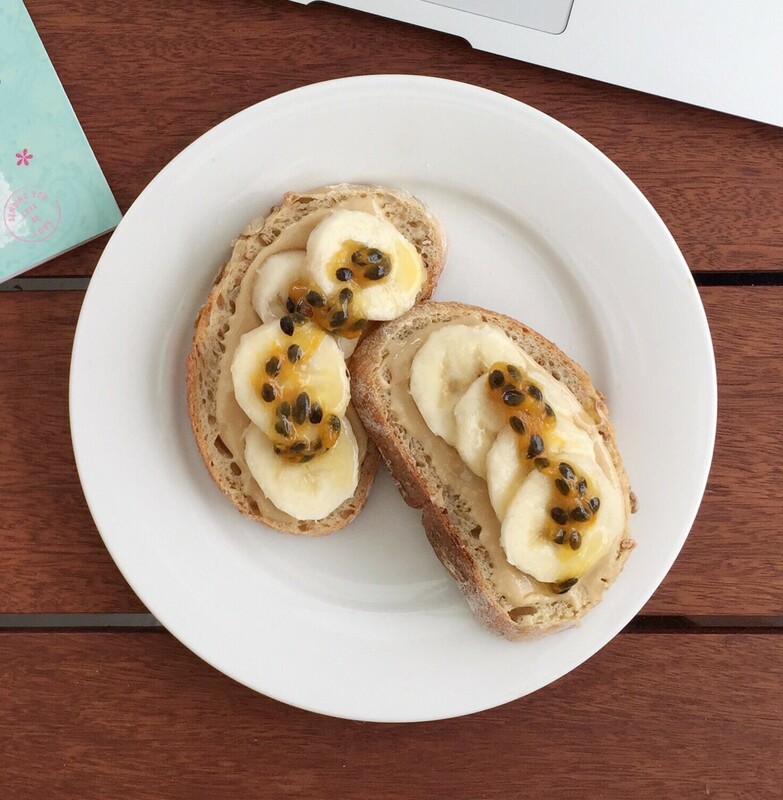 My favourite combination is peanut butter, banana and honey – particularly delish on wholemeal muffins before a Tri! Otherwise cottage cheese (or ricotta) with raspberries and sliced peach! Oh I love the cape seed loaf from Baker’s Delight! Probably the only non-sourdough bread I like. Can’t go wrong with PB + banana!